My name is Lily and I am a hoarder. Wow. It feels good to finally admit it. I can’t get rid of anything. I’ve saved the contents of birthday goodie bags since I was 36 months old. I have stickers from places I can’t even remember I’ve been. I have five dead Zhu Zhu hamsters under my bed. My room is piled high with used up coloring books, ‘treasures’ I’ve found floating in the gutter and stuff I got from grammy. The biggest enemy of an admitted hoarder? The mom who suddenly thinks it’s time to ‘purge’ your toys. It usually starts like this, “Sweetie, don’t you think it’s about time we give away your [Insert Favorite Toy Here]?” Bite me. 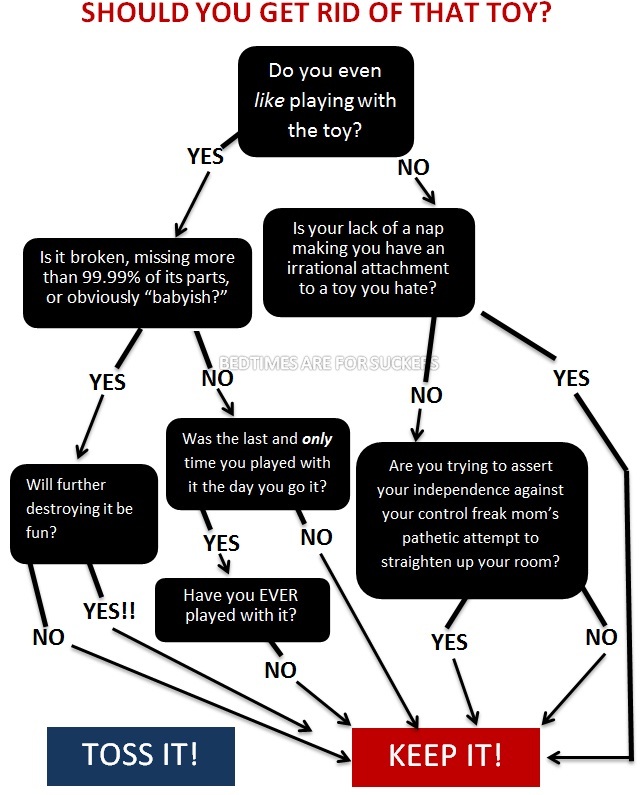 For those trying times I’ve created a handy decision tree chart to help you decide whether to keep or toss your precious items. It works for me! 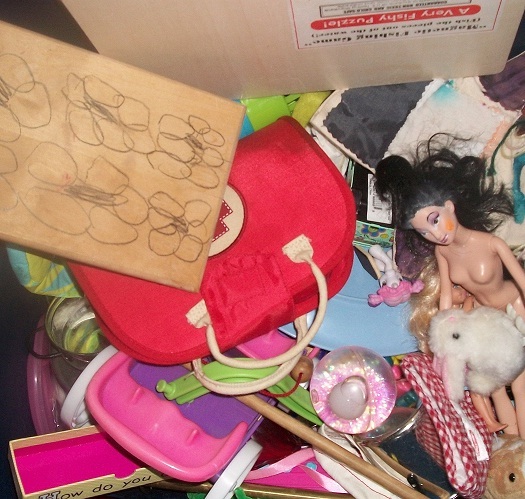 Tags: cleaning, hoarder, how to organize toys, toys | Permalink. How could I have forgotten how funny it is over here?? I need to get a system down… so I don’t miss a post. Oh, doh, I know: SUBSCRIBE! yep – that sums up our piles of crazy! what I like to do is secretly take a few toys here and there, then put them in the garage to take to the goodwill or for that huge garage sale we’re going to have some day, but they end up just staying there with the door closed. I’ve added the incentive of payment–yes, I’m actually paying my daughter a bounty on her old toys. Have gotten rid of eight trashbags full so far.